The text of some chapters are presented here, manually typed in from scans. The text is printed with 'ſ' for 's' except at the end of words; this is modernised for legibility (except in illustrations and their legends), but encoded differently so that the custom of the original can easily be restored. A few obvious printing errors have been corrected (the actual printed text is included in the source code). The images are adapted from the same source, but as most illustrations in the English translation are mirrored with respect to the original, I have reversed them back to their original orientation. I have also corrected some small errors, and coloured labels and scale bars red for clarity. Some images link to a page discussing variants of the illustrations. Of the Name of Lapland. Of the Situation of Lapland. Of the temperature of the Air, and soil of Lapland. Of the Division of Lapland. Of the Laplanders in reference to the inclinations, temper and habit, of their minds and bodies. Of the Originall of the Laplanders. Of the Religion of the Laplanders. Of the second, or Christian Religion of the Laplanders. 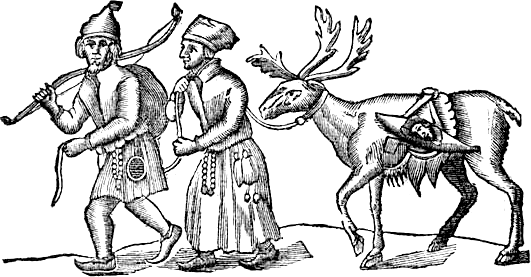 Of some remains of Paganism in Lapland at this time. Of the heathenish Gods of the Laplanders, and their manner of worship at this day. Of the magicall Ceremonies of the Laplanders. Of the Government of the Laplanders. Of the Judicatures and Tributes of the Laplanders. Of the Laplanders Fairs, and Customs in Trading. Of the Language of the Laplanders. Of the Houses of the Laplanders. Of the Garments of the Laplanders. Of the Diet of the Laplanders. Of the Hunting of the Laplanders. Of the Laplanders Weapons, and other instruments of Hunting. Of the Emploiments common to both Sexes. Of their Contracts and Marriages. Of their Child-bearing, and the Education of their Children. Of their Diseases, Death and Burial. Of the wild Beasts of the Laplanders. Of their Birds and Fish. Of the Laplanders Trees and Plants. Of their Stones, Jewels, and Pearls.